Ever since I was little, when I used to watch documentaries with my grandfather, I already knew that I would dedicate my career to telling factual stories. For that reason, in 2013 I graduated in both Biology and Audiovisual Communication degrees at the Autonomous University of Barcelona (UAB). The following year, I received the Leonardo DA Vinci internship (EU) and I went to Bristol, the “Hollywood of documentaries”. There I was so fortunate to work at Humble Bee Films as a Researcher on the third series of David Attenborough’s Natural Curiosities (UKTV, BBC, Netflix). Once back in Barcelona, thanks to this great experience, I pitched a program about Catalonia’s wildlife called “Animalades” that was produced by the Spanish National Television (RTVE) in 2015. At the same time, I also worked at CropTV as an Assistant Director on a documentary called The Blind Monkey (Nat Geo Wild). During my career, I’ve worked on other series and featured films related with lab science, such as “El Cazador de Cerebros” (RTVE), or history, as That’s the Story (RTVE, TV3); a 50 minute documentary in which the Nobel prize winner Professor Roy J. Glauber remembers the Manhattan Project. 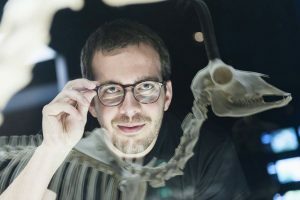 Aside from working on audiovisual projects, I teach a scriptwriting workshop at the UPF’s Master in Scientific, Medical and Environmental Communication, I have my own blog in El País called “Historias Naturales” and in National Geographic Spain (RBA) magazine called “Mito o ciencia”. Thanks to all of this, last year I was granted a travel fellowship to attend the World Conference of Science Journalism held in San Francisco. From there I travelled to México to write my first series of overseas reports published in El País and Discover Magazine. I am a member of the National Association of Science Writers (NASW), the European Union of Science Journalists’ Associations (EUSJA), the World Federation of Science Journalists (WFSJ), and the Natural History Network (NHN).